Few BBQ sauces can claim the longevity of Mrs. Griffin's Southern Barbecue Sauce. This tangy Georgia staple has been in production since 1935. What started as a treat served during Griffin family gatherings, has grown into one of the most recognizable regional BBQ products in the Southeastern United States. Macon Native, Mangham Edward Griffin started bottling and selling his mustard / vinegar sauce at the urging of his family. After the first batch sold out of his brother's grocery store in a heartbeat, Mr. Griffin realized he had stumbled upon a new profession. Naming the sauce in honor of his wife, he produced it in his own kitchen for years until finally opening a full scale production plant in 1949. Mrs. Griffin's has grown a great deal over the years. Though still a regional favorite, Mrs. Griffin's can now be found in major retailers all over the country. While the original sauce remains unchanged, they have added "Hot" and "Hickory Smoke" flavors. Mrs. Griffin's recently reached out to The "Q" Review to have their Original and Hickory Smoked sauces reviewed. Having never tasted Mrs. Griffin's before, I was happy to oblige. I was familiar with the brand, having seen it in grocery stores from time to time. Since the two sauces have such similar recipes, I decided to test them in tandem. Each time I used the Original flavor, I also used the Hickory Smoked sauce. 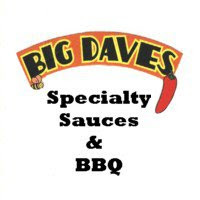 Both sauces are available in 12 oz, 32 oz., and Gallon plastic bottles. Mrs. Griffin's signature red labels are very simple, but appealing. The classic styling takes you back to the sauce's origins. Though a product of Georgia, Mrs. Griffins displays the characteristics of sauces typically found in the low country of South Carolina. Mrs. Griffin's is an ultra tangy mustard / vinegar blend accented with a variety of spices. The Hickory Smoked flavor sticks with the original base and adds liquid smoke for an additional dimension of flavor. One very unique thing about Mrs. Griffin's sauce is that the ingredients are not cooked. According to Mrs. Griffin's website, the ingredients are mixed in a twelve step process that actually takes four days. The mixing process has a lot to do with why the sauce is so tangy. Heat typically mellows things like tang and spice. I used both sauces on multiple occasions. First, I used the sauce as a dip for pulled smoked chicken. As a dip, the sauce's flavors are very strong. The mustard and vinegar overwhelmed the mildly smoked chicken. Later, I brushed the sauce on chicken quarters as they finished smoking. The heat mellowed the sauces a bit, but the mustard flavor was still quite strong. Because the sauce is so thin, it's not ideal for glazing. I've mentioned many times on The "Q" Review that mustard isn't my favorite base ingredient for BBQ sauce. That being said, I always try to keep an open mind when sampling and reviewing sauces. I've had several mustard base sauces that were very good. Often, mustard sauces are accented with sweet and spicy elements giving them additional depth. Mrs. Griffin's, however, is pure mustard tang. I respect the sauce for staying true to its regional roots, but it's difficult for me to see the sauce appealing to palates outside of the Southeast. 5 Response to "Mrs. Griffin's Barbecue Sauce"
Try it on pinto beans, salmon patties, or any number of other items. On occassion as I'm eating or just thinking about eating something, it occures to me how the flavor would be enhanced by dribbling a little Mrs Griffin's on it. I lived in Ga for 50 years and grew up having it on pit cooked shoulders, sliced and pulled; moved to central Alabama 10 years ago and have to buy a gallon on return visits. and memories will return to you from the Good Times that were had when you were enjoying this delicious food. The coleslaw that usually accompanies it on a bun makes it twice as good because it becomes crunchy and it is so good you practically can let it melt in your mouth. 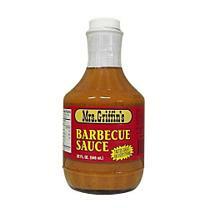 It is good on many things and when you hear the words "Mrs. Griffin's Barbecue Sauce" your mouth begins to water. MMMMMMMMMMMMMMMMM Good!!!!! Try some you will enjoy what is the best in the South. It just keeps on giving. I've, had every store bought BBQ sauce that I can find. But this one to me hands down is the best. I like it more than the home bbq sauce from two of the three around my local area. Turners BBQ in lithia springs,GA still has them all beat. But seriously it is awesome!